Only 120 km South-West from Ho Chi Minh, approximately 2.5 hours driving, we’ll escape totally from the bustling city to another world: a world of water and lush vegetation, a world where people have a relaxed and happy life together. 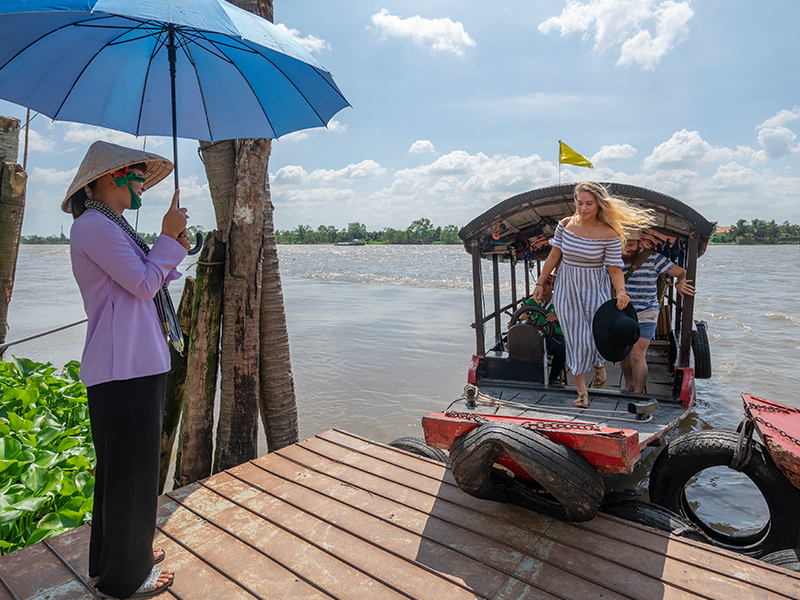 Cai Be is the typical image of Mekong Delta: bustling floating market, traditional handicraft villages and fruit orchards. Mekong Lodge is hidden among these luxuriant gardens of mango, longan, rambutan, durian trees and flowers. 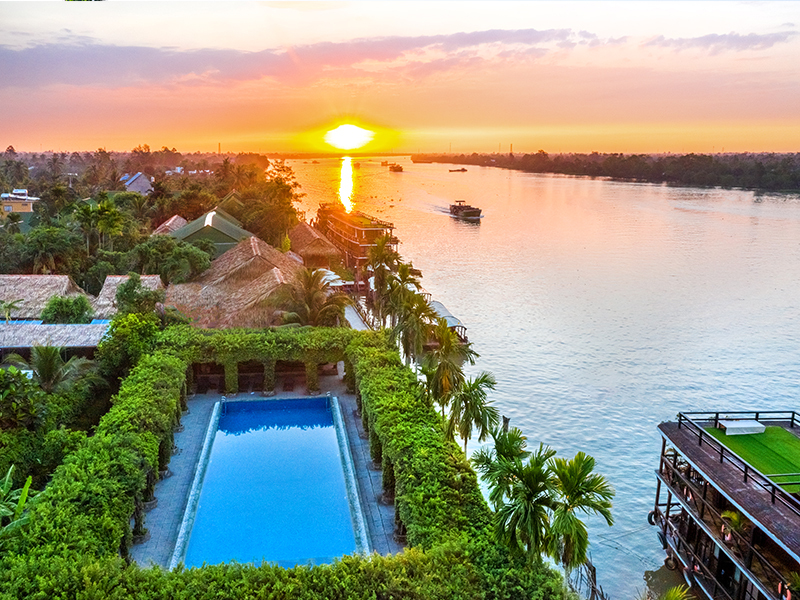 To reach Mekong Lodge, the only way is by boat as it is situated on an island deposited by the Tien River. Here, boat is the most popular means of transport for locals to move from one place to another. Mekong Lodge has 30 private charming Bungalows and a Riverside Restaurant, stretching in an area of more than 12.000 m2. Our ideas were since long time ago and our dream came true in November 2011. Mekong Lodge is now ready to welcome travelers who are looking for a real discovery in Mekong Delta. Mekong Lodge is the only Eco-resort in Mekong Delta at the moment! Mekong Lodge is the first accommodation property that is fully committed and engaged in Responsible Tourism in Mekong Delta, Vietnam. We build green bungalows and services that bring travelers delightful experience of Mekong Delta as well as contribute to sustainable development of local environment and community. • We support local charity organizations such as schools and training centers for the disadvantaged. • We provide our employees with good working conditions and equal profit-sharing scheme. • Our itineraries are off-beaten: we allow travelers to feel free to engage into local life, engender respect between tourists and hosts, and builds local pride and confidence. 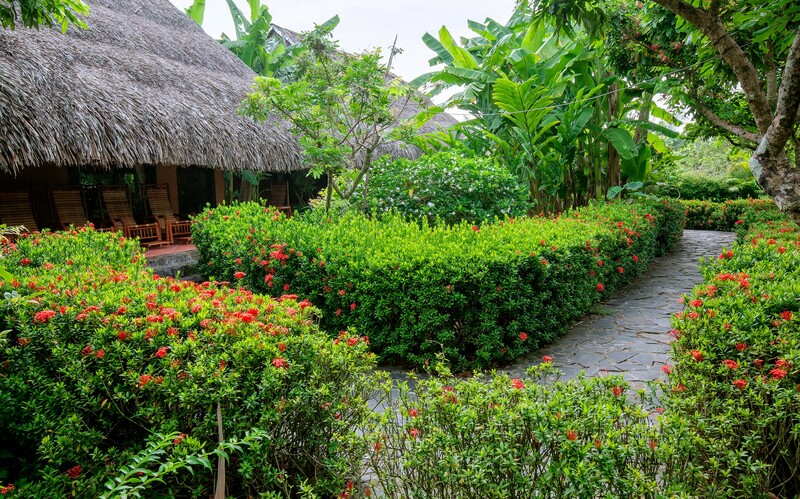 • Our bungalows are made from eco-friendly materials and purposefully designed to produce no waste as well as mitigate its carbon emission to Mekong Delta and its environment. • We planted a lot of tree and flower before the lodge construction and continue growing more and more greenery.